We first learned M. Night Shyamalan had commenced work on a new micro-budgeted film titled Sundowning back in late February, but nothing else was known of the project until today. Described by The Wrap as a thriller, the film centers on a single mother (Kathryn Hahn, Bad Words) with two kids who visit their grandparents and things go very wrong. Ed Oxenbould (Alexander and the Terrible, Horrible, No Good, Very Bad Day) plays her son, who is protective of his sister. 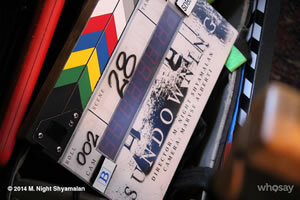 Shyamalan has a small crew shooting in Philadelphia and production is said to be close to a wrap. Without a distributor, I’d have to speculate Shyamalan might take the film on the festival circuit. Though, while Shyamalan’s star has definitely fallen since The Sixth Sense, a studio would be silly not to give the film a look if given the chance.